Mason Jar Flowers [D6511] - $6.00 : Yarn Tree, Your wholesale source for cross stitch supplies. 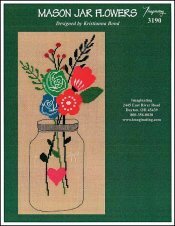 Cross stitch chart from Imaginating. Designed by Kristianna Bond. It's a bouquet of spring! Large red, green & blue flowers are blooming out of the mason jar. A heart is stitched on the outside of the mason jar, bringing warmth to the soul. Bloom into spring by stitching this design. Stitch count 84v x 173h.